Cancer and Leo are the only signs solely assigned to a single luminary of the Moon and Sun respectively. 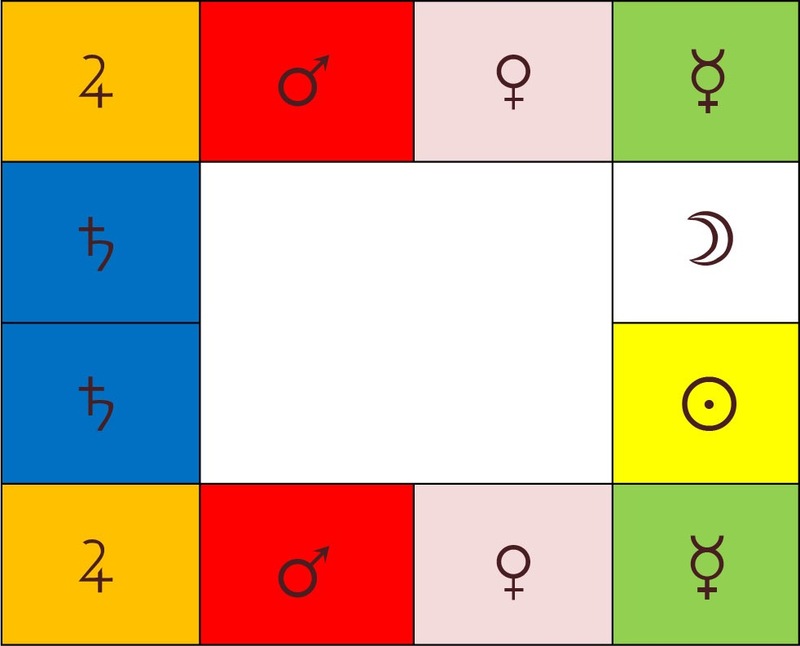 Then the co-rulership signs go in order of Virgo-Gemini ruled by Mercury, Libra-Taurus ruled by Venus, Scorpio-Aries ruled by Mars, Sagittarius-Pisces ruled by Jupiter, and finally Capricorn-Aquarius ruled by Saturn. The first big stroke of luck for my research came at the Louvre in 1993. In the bookstore was a copy of the magazine, Archeologia2 with a picture of the Egyptian Sky Goddess Nut on the cover. She had the signs of the zodiac running down both sides of her body in the co-rulership order. It was from the Hellenistic Egyptian period of 200 AD.3 There are at least three of these images documented in various museums. Inside the lid of the sarcophagus was the planetary order that I had been looking for. The order is very important. It starts with the two luminary signs of Leo and Cancer on opposite sides of her body. Leo and Cancer are single rulers and then the co-rulership signs extend down Nut’s body. Goddess Nut from 200 A.D. In 1996 I was at the Project Hindsight Conference in Ithaca, NY lead by Robert Hand and Robert Schmidt on Hellenistic Astrology. The large room was full of astrologers and anonymous academics from Cornell University. During lunch, I had a conversation with Avery Solomon who had a Ph.D. in Mathematics and taught at Cornell University. I shared with him that Carl Payne Tobey had claimed that the planetary order assigned to zodiacal signs was based on the average mean distance from the Earth. 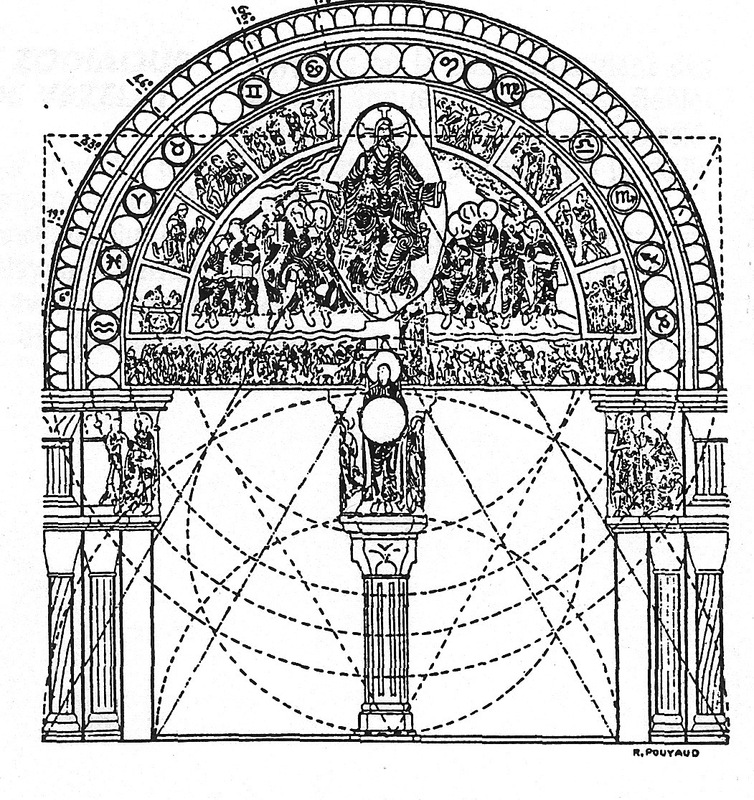 Avery had the necessary software on his PC to model the principle of celestial mechanics. 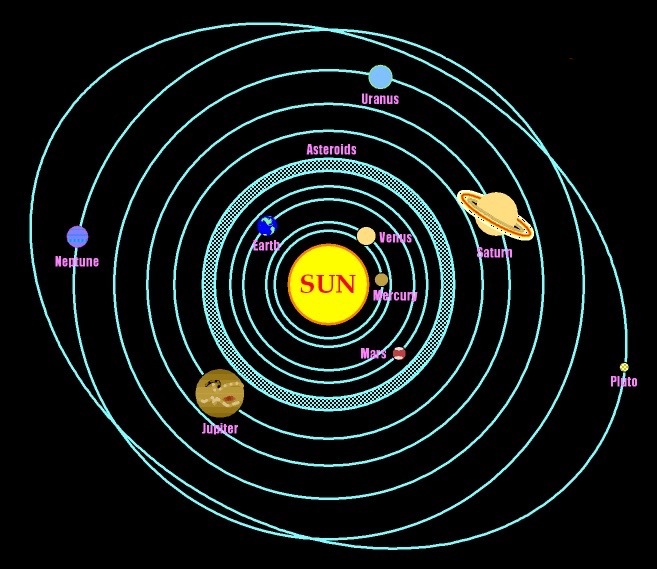 He showed me that from the Earth’s point of view, Mercury and Venus did stay behind the Sun the majority of the time. The model confirmed the Hellenistic planetary order. Sadly I didn’t get a copy of his program. I saw the proof but I didn’t have the solid evidence. Yet with the discoveries in the Western World by Kepler of planetary motion and Galileo’s re-discovery of the Sun as the center of the Solar System, why did this strange astrological order persist? The Roman Catholic Cathedral of Vezelay, France still displays the old planetary order but Christ in the center, rather than the Goddess Nut dividing the signs between Cancer and Leo. As astrologers, we have forgotten to look at the astronomy side of this picture for the answers. Yet, all of our astrological structure is based on sacred geometry, astronomy and mathematics. The best minds in the Ancient World were astrologers until the Church and the Scientific Revolution (1750 to 1850 AD) suppressed astrology. We are still recovering this knowledge thanks to serious scholars like James Holden, Robert Zoller, Robert Hand, Robert Schmidt and Benjamin Dykes in reconstructing our past with new translations. Now we have a new generation of young astrologers trying to put the pieces together like Chris Brennan and others. Add to this the power of computing and the Internet to disperse this reconstructed knowledge. We can now share this revived knowledge with our colleagues in India and the Arab World. There is said to be over a million astrological manuscripts to be translated in India, let alone the Arab World and in China. However, the fundamental issue of planetary order has yet to be explained. Carl Payne Tobey discovered this answer back in the 1933. This is because he studied the sacred geometry structure embedded in astrology’s design. But he left no proof and no references. It simply wasn’t the style of astrologers in the early to mid 20th century to document. A good portion of what they discovered for themselves was shared with their private students but not necessarily published. 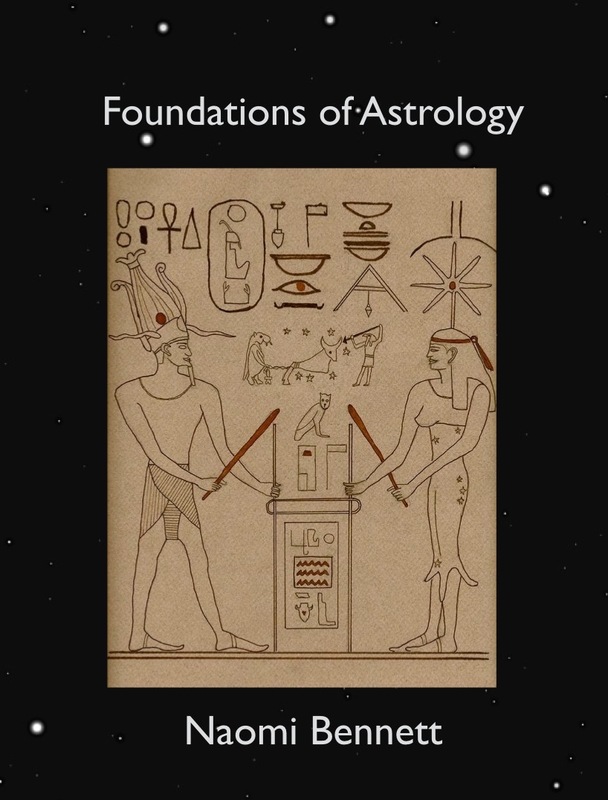 We can thank James H. Holden for documenting 2,200 astrologer profiles6 and to the few astrological libraries we have in the USA and UK that have preserved 20th century manuscripts so we can recall the work of past astrologers in the prior century. 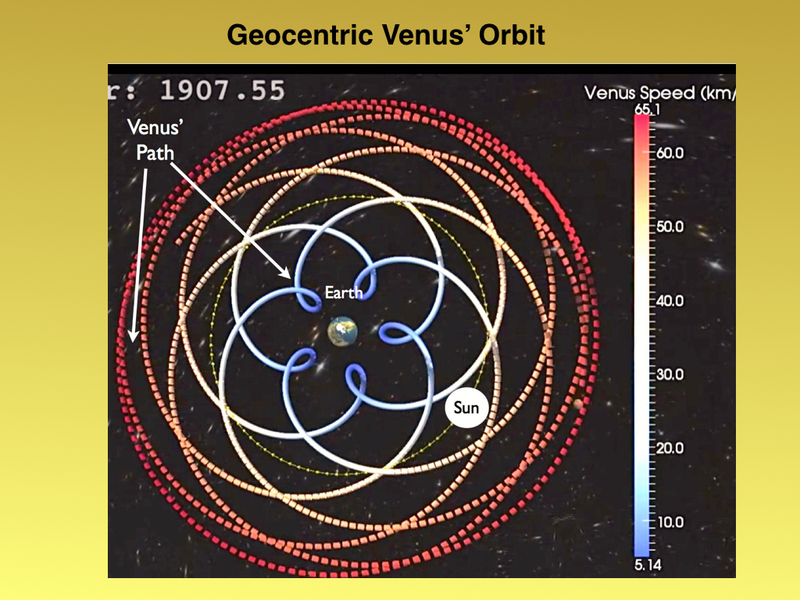 This is a screen shot of John Mick’s video on the geocentric model of the Sun and Mercury traveling around the Earth.7 He used the real position and velocity data from NASA/JPL. This is a video on YouTube that I highly recommend watching. The Earth is at the center. The Sun is a small dot going around the Earth in a single circle. 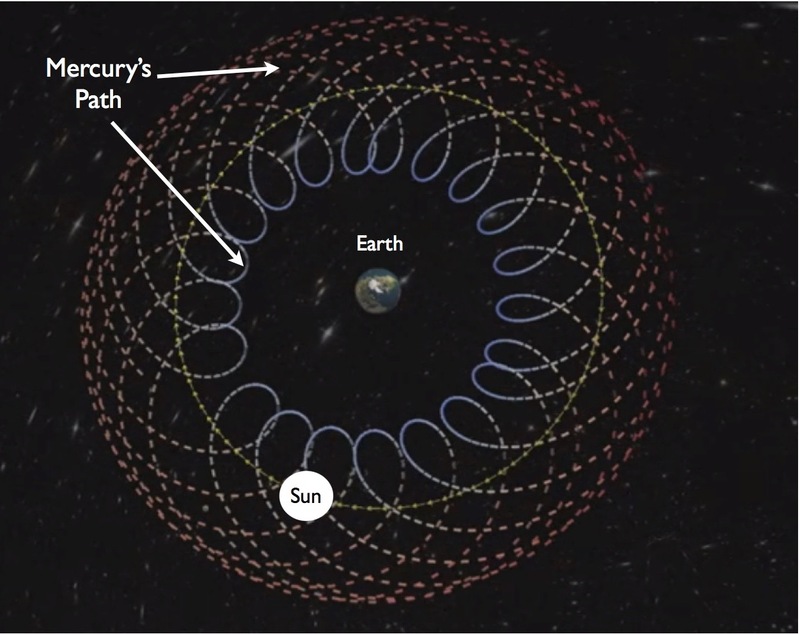 The rest of all the curved lines are many years of Mercury transits from the Earth’s point of view. The key element is that most of Mercury’s transit time is outside the Sun’s circle. Mercury spends more time behind the Sun from the viewpoint of Earth. The loops are Mercury stations and retrograde periods. The Earth is in the center of both images. The Sun is a small dot in a single circle around the Earth. All the outer circles are either Mercury or Venus moving around the Earth over a period of years. It is very clear in both images that Mercury and Venus spend more time on the far side of the Sun. The Sun is closer to Earth during most times of the year than Mercury or Venus. When the inner planets of Mercury and Venus cross in front of the Sun’s path they slow down and then appear to us as being in retrograde motion. This is the proof that these ancient astrologers knew that the Sun is closest to the Earth, after the Moon, most of the time. They weren’t so stupid after all. They knew about average mean distance! Think about it. If the Egyptians observed Venus as a morning and evening star for hundreds or thousands of years, it’s likely they figured it out that Venus was moving behind the Sun. The base of the Great Pyramid is a ratio of the circumference of the Earth and each face represents a quarter of the Northern Hemisphere. I believe the Egyptians knew this fact and showed it in picture form with the Sky Goddess Nut. This planetary assignment follows a system of logic based on an observable astronomical fact of average mean distance to the Earth. It brings us to the discovery of the outer planets of Uranus, Neptune and Pluto. If we maintain this planetary order of average mean distance, then Uranus must be assigned to Aquarius, Neptune to Pisces and Pluto to Aries. This is not a haphazard assignment done by wishful thinking. This is beyond coincidence. As a minor side note, please remember that one of the original meanings of the word ‘rulership’ is ‘to rule’ or ‘ruler’ also meant to measure or to measure lengths. I believe this is the original meaning of rulership in astrology. Rulership is to measure. Just like the Egyptians were the master geometers, they made Mercury the God of Measurement! I understand this stirs up the debate about the assignment of Pluto to Aries but it cannot be avoided.10 As a student of modern and traditional astrology, I can understand the avoidance of using the outer planets. It upsets the Essential Dignities. The only way to use the Dignities is to use only the old co-rulerships. Using the old rulerships keeps all the Hellenistic and Medieval rules and techniques in place. Jyotish astrologers have the same problem using the outer planets in evaluations. They only use the old co-rulers for the Dignities. But many Jyotish astrologers do incorporate the newly discovered planets for transits. This is the recognition of these three new planets having an astrological effect, but no one wants to deal with updating the Dignities. At least now there is strong evidence that average mean distance from Earth is the basis of the underlying pattern behind Hellenistic planetary order. There is just too much evidence that the outer planets are real and they work. At some point these conflicting issues need to be addressed. Having Uranus on the Ascendant in a natal chart is not the same as having Saturn there by substitution to conform to the Dignities. Having Jupiter be the ruler of Pisces is not the same as having Neptune as its ruler. These are poor substitutes considering that we have more than 100 years in studying these planets. This disturbs Receptions when using more than the ancient seven planets. When the technique of finding final dispositorship is used, it can give a false answer because of only using the old rulerships. Modern astrology needs the Dignities revised. This is necessary in the integration of the traditional and modern astrology for this 21st century. 1.Stecchini, Livio Catullo,“Notes on the Relation of Ancient Measures to the Great Pyramid,” Appendix to Secrets of the Great Pyramid by Peter Tompkins, Harper and Row 1971, pages 294-5. 3.http://www.britishmuseum.org/explore/highlights/article_index/f/the_family_of_soter.aspx The tomb of the Soter family of Archon of Thebes, discovered in 1820, contained fourteen mummies in rectangular wooden coffins. The coffins belonged to members of the family of Soter, Archon of Thebes. Several of the coffins were inscribed in Greek with Soter’s name and genealogy, which means that they can be dated precisely to the early second century AD. Theban Tomb 32 in the el-Khokha area on the west bank of the Nile. 4.Stecchini, Livio Catullo ,“Notes on the Relation of Ancient Measures to the Great Pyramid,” Appendix to Secrets of the Great Pyramid by Peter Tompkins, Harper and Row 1971, pages 287-382. 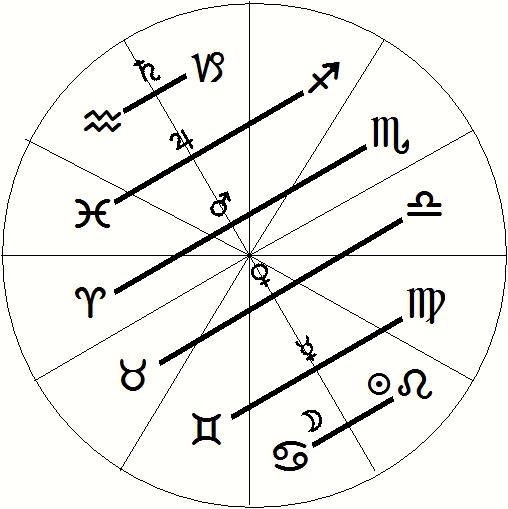 6.James H. Holden, Biographical Dictionary of Western Astrologers, A.F.A., 2013. 7.https://www.youtube.com/watch?v=VhA4bl7B-1M&list=PLEBA7CD7FD2564042&feature=c4-overview-vl Published 28 April 2012.